Spring Metrics, a real-time conversion acceleration and tracking company, today announced the launch of Smart Offers, a quick-deploy solution that uses behavioral targeting to present personalized offers to website visitors in real time. Smart Offers is the first in a series of Smart Content solutions from Spring Metrics. Spring Metrics, a real-time conversion acceleration and tracking company, today announced the launch of Smart Offers, a quick-deploy solution that uses behavioral targeting to present personalized offers to website visitors in real time. Smart Offers leverages Spring Metrics’ Smart Content platform, a behavioral targeting engine that profiles visitors real time, then acts as an automated sales agent as these customers and visitors arrive at a web site. Smart Offers has increased revenue on participating sites by over 32 percent in a single month, instantly capturing new revenue from existing site traffic. 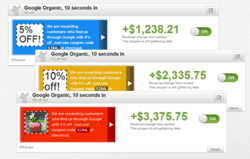 Smart Offers allows segmented targeting of customers and visitors. For example, a website owner can configure one type of offer to be served to "lurkers"—people who visit the site repeatedly but have not yet purchased. Similarly, they can configure another type of offer that targets social media visitors by delivering custom incentives to visitors who arrive from, say, a Facebook fan page. In either case, setup and launch takes mere minutes. Smart Offers users can target an array of custom visitor segments using traffic and browsing history trends supplied by Spring Metrics’ Smart Content engine. The custom trigger options include: number of visits, previous purchase history, amount of past revenue, referring source, specific landing pages, keyword and time on site. Smart Offers enable these powerful outcomes without subjecting website owners to complicated analysis or time-consuming content creation. The offer creation process takes minutes, providing website owners the agility to quickly deploy a series of successful promotions with virtually no lead time required. Smart Offers provides campaign-level analytics, allowing website owners and marketers to see which offers are working best. Armed with this data, campaigns can be quickly revised to achieve maximum ROI. There’s no need for guesswork or data-crunching. By employing and testing a variety of Smart Offers triggers and content styles, website owners can pinpoint which offers most effectively cause shoppers to load up their online carts and buy. When coupled with the Spring Metrics Smart Content analytics platform (included in all Smart Offers plans), a website owner can quickly identify which visitor segments are underperforming and then quickly launch offer campaigns that target those segments. New offers can be launched in minutes. Smart Offers features an array of customization options. Website owners can create offers that match their own site designs and also add flourishes that make their incentives stand out, or blend in as desired. From the initial setup to design and launch, the process is point-and-click simple. Smart Offers are designed for marketers, so there’s no extra code to install and no need to rely on programmers. Smart Offers are available immediately. More information can be found at http://www.springmetrics.com/smart-offers. Spring Metrics solutions increase revenue for online merchants through automated, real-time onsite customer interaction at the point of customer conversion. Utilizing behavioral targeting, Smart Content from Spring Metrics personalizes onsite customer engagement to increase conversion rates and capture more revenue from your existing site traffic. For media inquiries, please contact Chuck Hester, chuck(at)springmetrics(dot)com or 919/607-1522.